McMenamin spent time at the Berlin-Ichthyosaur State Park in Nevada this summer, examining the fossilized remains of nine 45-foot-log ichthyosaurs, giant marine reptiles that thrived during the Mesozoic era. In the 1950s, Charles Camp of U.C. Berkeley posited that these ichthyosaurs had died accidentally in shallow water or from ingesting a toxic plankton bloom, but a more recent analysis of the rocks around the fossils suggest that it was actually a deep-water environment, putting that theory in doubt. That was the mystery that initially attracted McMenamin to the site, but it was the state of the bones that grabbed his attention once he got there. Not only did they indicate that the reptiles hadn't all died at the same time, but they also appeared to have been "purposefully rearranged," a behavior exhibited in the current era by none other than the octopus. He also noted that the skeletons had twisted necks and many more broken ribs than would be expected in an accidental death. But that isn't something any normal-sized octopus could pull off. Only a true colossus of the sea could capture and kill such massive prey. 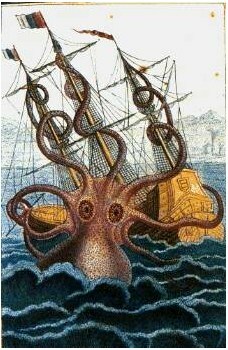 Only... a kraken! "I think that these things were captured by the kraken and taken to the midden and the cephalopod would take them apart," McMenamin said. Even more bizarrely, the vertebrae are arranged in patterns similar to those of sucker discs on cephalopod arms. "In other words," the Geological Society of America stated in a press release, "the vertebral disc 'pavement' seen at the state park may represent the earliest known self-portrait." Lending credence to McMenamin's theory is a discovery by the Seattle Aquarium, captured on video, that large octopuses actually hunt and kill sharks. "We think that this cephalopod in the Triassic was doing the same thing," McMenamin said. "It was either drowning them or breaking their necks." His theory will be very difficult to prove. His hypothetical kraken is soft, squishy and, aside from its beak, entirely boneless, which means the likelihood of finding any fossilized evidence of the thing is extremely low. Nonetheless, McMenamin, who presented his findings at the annual meeting of the Geological Society of America yesterday, is confident in his work. "We're ready for this," he said. "We have a very good case."